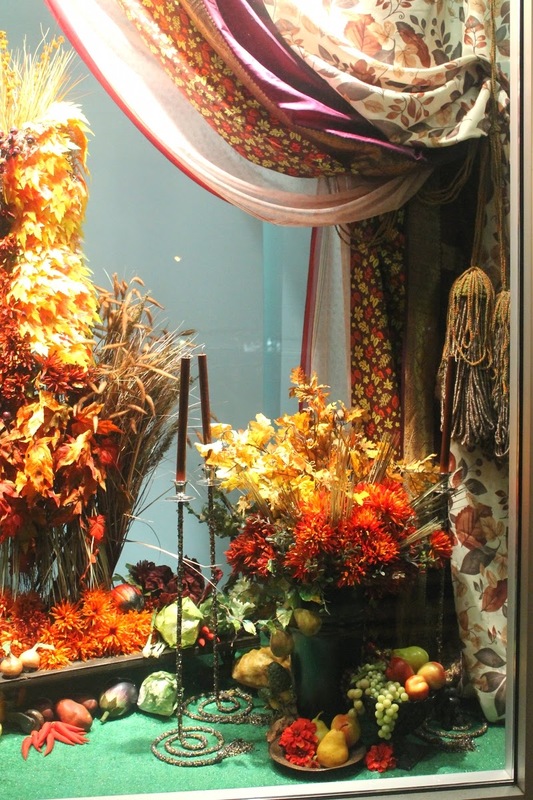 Happy Holidays: The Autumn window display at Hillside Shopping Centre. 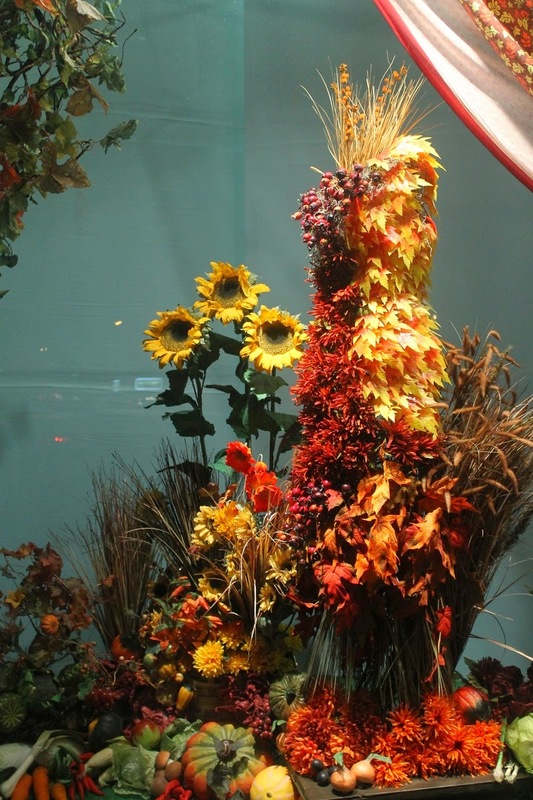 The Autumn window display at Hillside Shopping Centre. I love creating window displays. I like the grand scale of a window display. I like to use the ordinary in new ways. It is fun to stop people, to give them something new to look at. Hopefully it gives them a lift during the day. In a window that has merchandise in it the main reason is to sell that merchandise for the retailer. Very seldom does a chance come along to do a window display that gives the designer carte blanche with the design and installation. Michele Paget, the marketing director at Hillside Shopping Centre has given me this amazing opportunity. This is the Autumn window display for Hillside. I told Michele that the Autumn window would be a scarecrow with produce around the base, except the scarecrow would be a ball gown created with leaves and flowers. I love the drama of the curtains swagged back to reveal the lush display of flowers, leaves, and produce. Here is a closer look at the dress. It is on a wooden platform that has four antique iron casters from an old safe. The slight height variation gives distinction to the dress. Try this technique at home in some of your displays around the house. I have used this platform at home when I have done displays in our hallway. 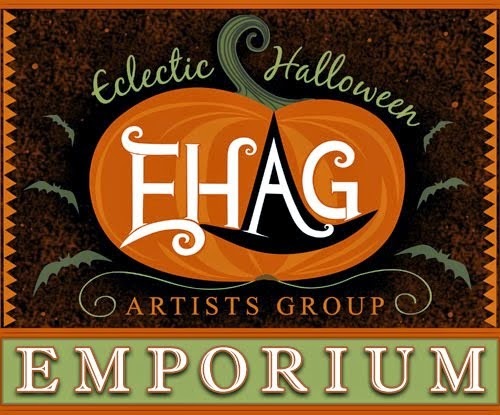 Have a look at these past displays here, here, and here. This link, here, shows you how I put the hallway displays together. The swagged curtains are held up by cording that I had used in one of the hallway displays at home. I created the two tassels to go along with the cording. They look elaborate but were relatively quick to make. There are three tall candle holders that I made a year ago that I decided to use in the window. The candle holders are supposed to look as though they are beaded ropes that are rising in the air; very much like the fabled Indian Rope Trick. The "rope" is a metal rod covered in antique, vintage and repurposed beads. Each bottom end of the rope is finished with a beaded tassel. They add a sense of mystery and drama to an already dramatic window. The vignette at the base of the swagged curtains. Almost everything that I use in the window displays I buy at Salvation Army and various other thrift stores. The chrysanthemums and grasses are in a large, and heavy I might add, green florists container. At the base off the arrangement is a very old beaten copper plate holding some fruit and flowers. Off to the left you can see the bases of the candle holders with their tasseled ends. That is this Autumn's window display. The Christmas window will be going in in mid November. Here is a sneak peek at one of the pieces that I will have for sale. love the concept of the dress being natural organic materials! Fabulous window! Thank-you very much! Those natural materials used for the dress are all synthetic "Made in China" faux flowers! HAHAHA!!!!! !